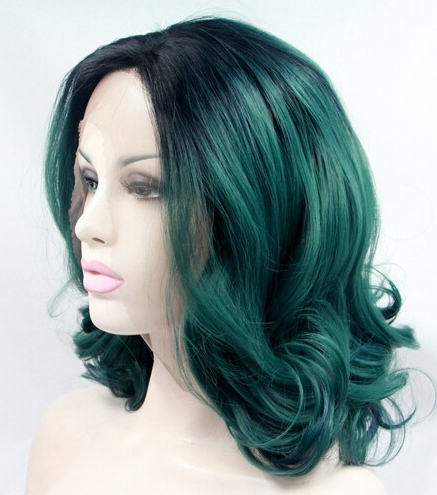 If green hair sounds odd, then check out the proof below that green lace front wigs can be a stylish and edgy look. 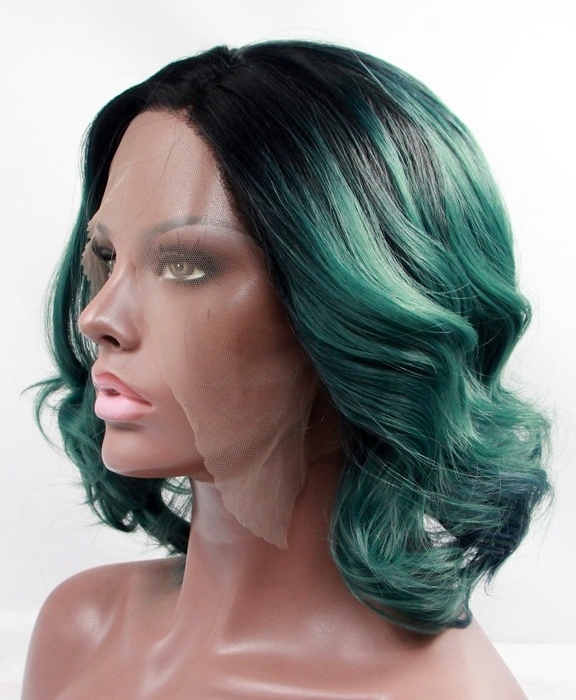 As long as you can find the right tone of green, then you'll be pleased to know that green lace wigs can suit every skin tone; in fact there's a tone or shade of every colour, for every tone and shade of skin. There are many shades of green, some darker that almost hint at blue, some that are warmer with suggestions of yellow and some paler that head towards turquoise. If you're choosing a green lace wig for reasons other than fancy dress, then the easiest and most accommodating way to do it is by going for dark roots either as a T-colour, ombre or dip-dye looks. If you're lighter in complexion or pale, the lightest shades of green will work well with your skin tone without washing out your complexion and if you're aiming for subtle or super chic looks then head to the darker shades of green including ombre effects - remember that very dark greens may strengthen the contrast between your skin tone and the green lace wig. If you really want to have fun, then beryl greens are great. If you have a darker complexion then hooray for you as any type of green will suit you, but if you're trying to go for a stylish instead of dramatic look then avoid the neon greens (of course if this is the type of green you love, then ignore this). Everyone can try getting their feet wet with a green lace wig where the green only appears towards the bottom of the hair (see last triple image below) as this is a softer transition into wearing a green lace wig. 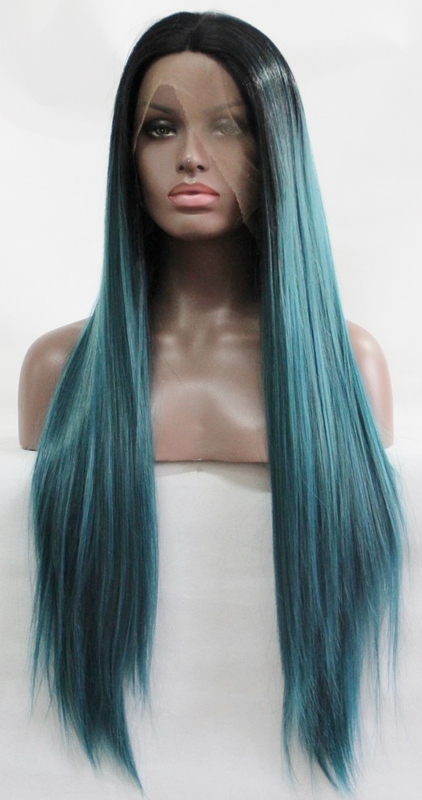 When choosing the length of your green lace front wig, it might be helpful to think about the shade of green, whether it's a single solid colour or a dip-dye look. If you're choosing a dip-dye look, then it's important to know how long the length of the darker root colour as your look can differ depending on which colour hair frames your face. The above left image shows longer dark roots which means the top part of the face is framed by darker hair. The above right image show shorter dark roots, which means the top part of the face is framed by the green coloured hair. 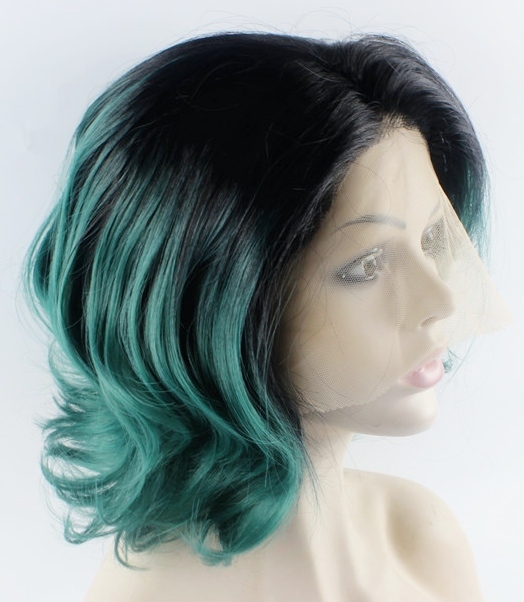 As always you can use our wigs by face shapes guide for the lengths that suit different faces but the best thing to think about when choosing the length of your wig is to think about the shade of the green. If it’s a dark shade of green then longer lengths in wigs won’t seem overly dramatic (of course, if that's what you're aiming for, then ignore this). If it’s a bright or pale green then the shorter the better might be preferable and if you have a wider face shape according to the wigs by face shape guide then a long bob is ideal as it's a shorter length but balances the width of wide face shapes. As always, if you’re going to wear green hair then it’s better to avoid wearing green clothes unless it’s a costume. Accessories such as belts can be in any colour as they're far enough away from the green lace wig so that they won't clash. The colours that don’t clash with green are blues and greens and other bold or strong colours. If you want to down play the colour of your green lace wig then lighter colours worn on the top part of your body will do that. Greens tends not to clash with other colours (and as we said in the blue lace front wig guide, the rhyme about "any colour and green must never be seen" is completely fictional and just a way for people to express their dislike for a particular mix of colours that includesgreen (such as pink and green, orange and green, or even green and green!). An easy rule to follow is that the lighter green lace wig, the more statement-making the look will be; and the darker the green lace wig, the more subtle the look. If you have a customised human hair green lace wig then you’ll need to deep condition with a conditioner specifically for green-coloured hair to ensure the colour doesn’t fade. It’s also important to remember that human hair wigs that have already been processed to achieve a green colour have already gone through several dyeing processes and so shouldn’t really be dyed again as it’ll shorten the lifespan of the wig as the hair will become damaged. Ta-dah! Proof positive that green lace front wigs, can be cool, chic and stylish and that anyone can wear them. The top tip is to keep to the shade of green that complements you and a length that’s manageable and your green head will turn others green with envy!